This stunning two-story, custom-built Colonial-Style Estate offers privacy, luxury and security at its finest. 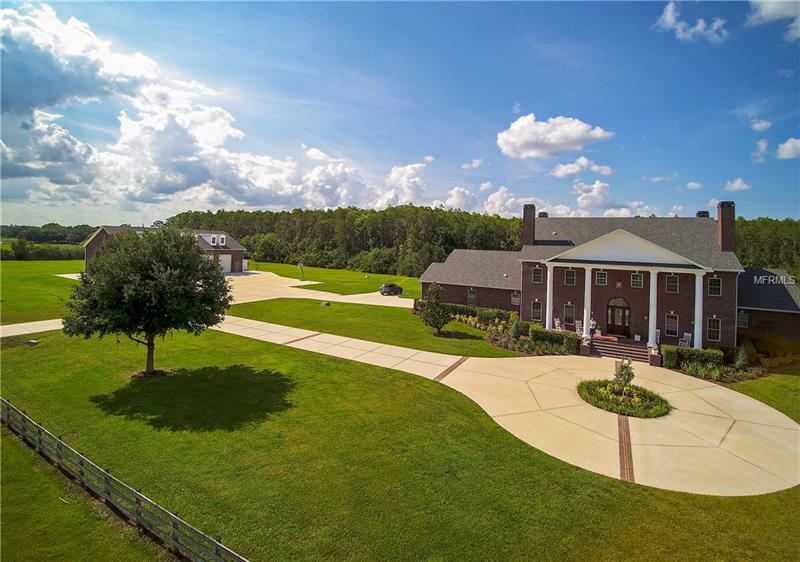 Situated on almost 20 acres, this unique masterpiece estate features very elegant details: five bedrooms, six-full-and-two-half bathrooms and attached two-car garage, all bedrooms have their own bathrooms & heat lamps, two of the bedrooms on the upper level have additional bonus rooms. Brazilian Cherry wood flooring throughout the home, five fireplaces and four hidden built-in safes plus walk-in safe room with granite countertops and custom cabinets. The gourmet kitchen includes a six-burner gas range, gas fireplace and beautiful nature view while dining, you can watch deer, osceola turkey and other wildlife. Two-bedroom, two-and-a-half bath apartment above the oversized five-car detached garage with custom finished Cypress wood walls and ceilings, full kitchen and laundry room. Discover the breathtaking views of the acreage from every room of the house and beautiful two ponds, front and back with a dock on the front pond stocked with bass and bluegill at your doorstep.